This year in the Spanish classroom we have expanded the use of the communication platform called Skype (www.skype.com) to communicate with Spanish speakers around the world. One occasion the Grade 10 students interviewed students at Williams College, a private school in Cuernavaca, Mexico. After giving the students a few minutes to get used to being able to see each other live on video, the students discussed such diverse topics as introductions, school culture, and pastime activities. Anna and Rachel, two YHS students on a 1-month reciprocal exchange at Williams College, also used Skype to share their experiences with the classroom. 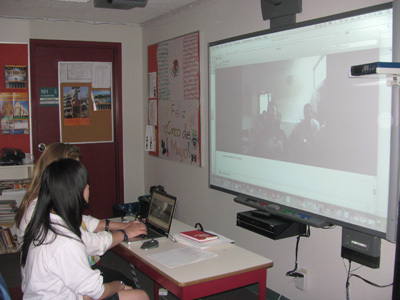 Our second major event was the Grade 11 students interviewing a teacher in Blanes, Spain. This provided a great opportunity for the students to use their Spanish skills to talk about the customs and culture of this region of Spain in an authentic language situation.